Cut 8 asparagus spears into 2-inch pieces; saute with 2 teaspoons olive oil and 1 minced garlic clove. 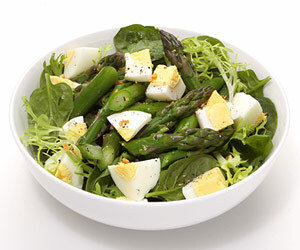 Top 2 cups greens with cooked asparagus, 1 chopped hard-boiled egg, 1 tablespoon vinegar and salt and pepper to taste. PER SERVING: 209 cal., 15 g total fat (3 g sat. fat), 108 mg sodium, 10 g carb. (5 g fiber), 11 g pro.